But people love them. I get asked for this recipe all the time. My husband gets really excited when he knows these are in the oven. Camp volunteers ask if we're serving "the muffins" again this year. I'm not sure what it is exactly. 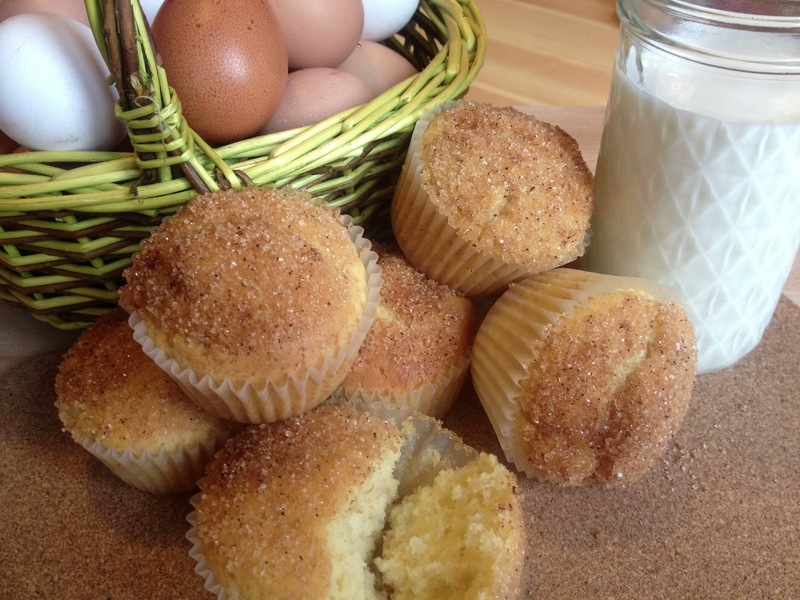 Something about the simplicity of it makes these muffins just so darn delicious. I found this recipe when I was scouring my cookbooks looking for breakfast recipes with easy-to-find, cheap ingredients that I could make for our first weeks of camp several years ago. And this one was definitely a keeper. It appears regularly on our camp morning menu. So for all the folks who have wanted the recipe over the years, this one's for you. Enjoy! 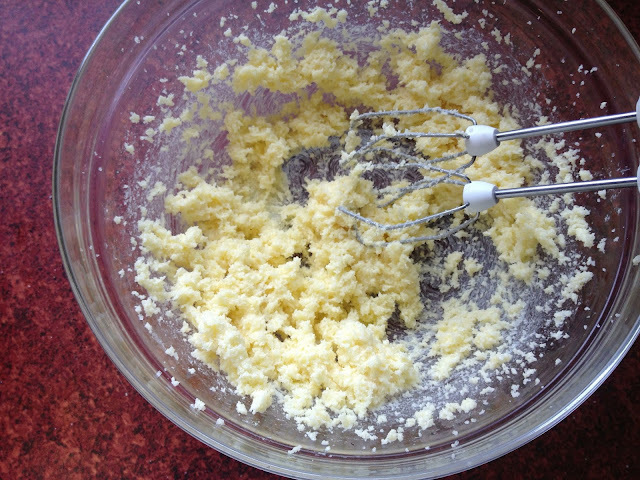 Make sure your butter (or shortening if you like) is soft. 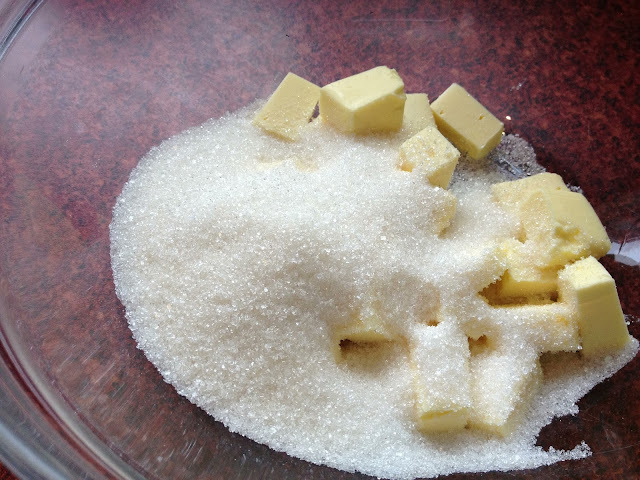 Then dump that and your sugar into a mixing bowl. Now mix it all up until the sugar and the butter are all nice and cozy together. Now go get two eggs from one of the overflow baskets cluttering up your counter and... what? you don't have various containers of eggs all over your kitchen? Well, my friend, you obviously need to get yourself some chickens. Or better yet, come to my house and help yourself. Hey look, the chickens seemed like a good idea during camp season when we are feeding 60 people every morning for breakfast. Now that camp season is done for the year.... well, let's just say you might be seeing some egg dishes on the blog in the near future. And maybe some chicken dishes. Anyway, beat in the eggs. And now the batter looks like this. Set that aside for the moment. Now get out another bowl. 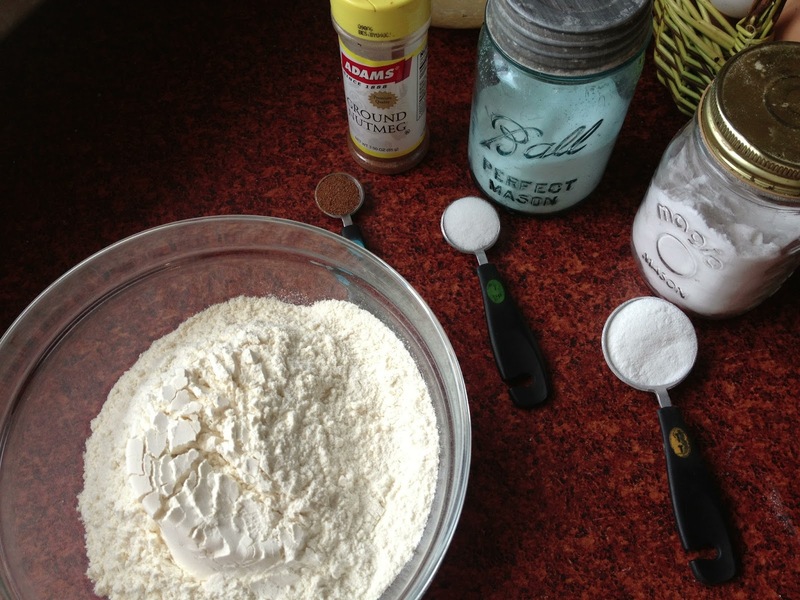 Mix your dry ingredients in it. 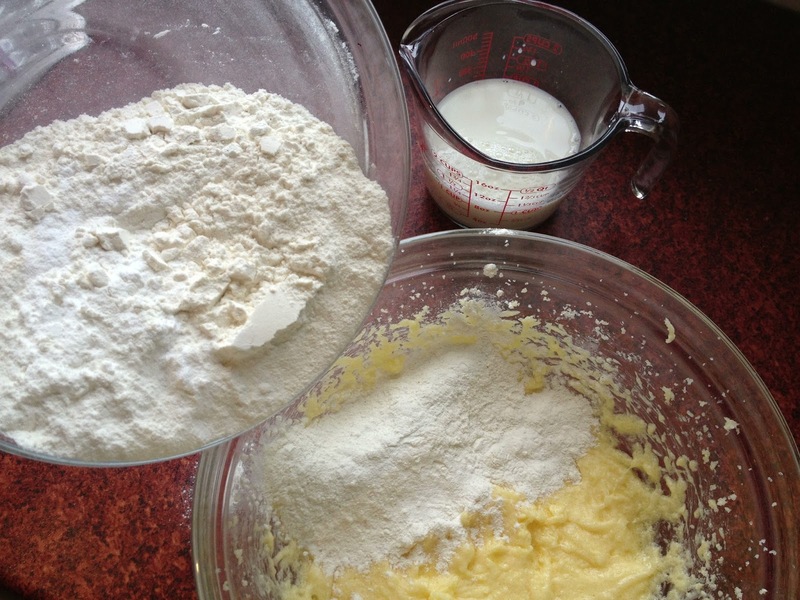 Now you take your bowl of dry ingredients, and the milk, and start adding them to the batter. First you beat in a little of the dry, then a little of the milk, then a little of the dry, then.... you get the idea. Whoever invented recipe terminology calls this "alternately adding the milk and the dry ingredients". So now you know. When you've combined all of it together, this is what you get. 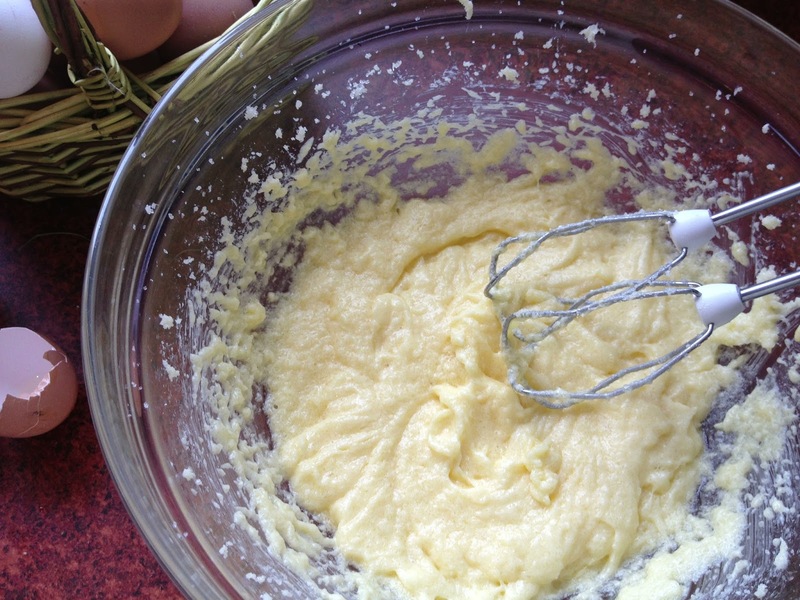 Divide your batter out into muffin cups. Fill the cups on the full-ish side-- you need them to rise over the tops of the paper so you can dip them later. See that muffin cup with batter in it? The one closest to you? Yeah, it's not full enough. I did that on purpose. Just to show you. You know, what NOT to do. Now bake for about 20 minutes until the tops start getting golden. While the muffins are in the oven, melt the butter in a bowl and mix sugar and cinnamon in a shallow dish. Now. 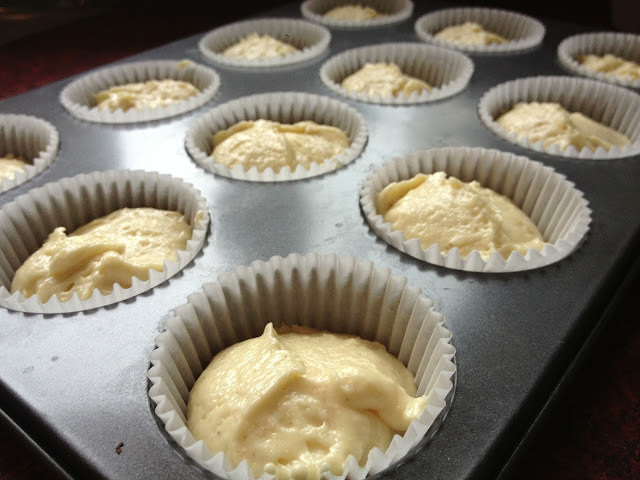 Let the muffins cool enough so that you can pick them up without suddenly sucking in your breath between your teeth and dropping the muffin on the less-than-pristine floor. Just sayin'. 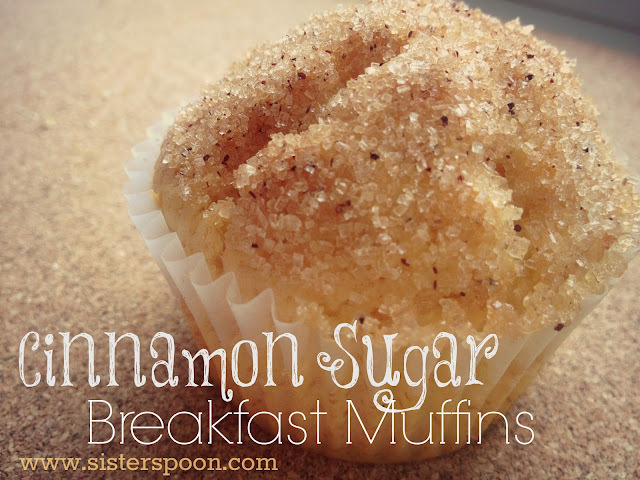 Then take each muffin, dip the top in the butter, and then in the cinnamon-sugar mixture. And now grab a pile of muffins and a glass of milk. Once two fluttering princesses, one grunting-and-pointing toddler and one grunting-and-grabbing husband come along, you may have one left to go with your milk. And there it is. The one you hid behind all the eggs. FOR THE BATTER: Cream the butter and the sugar until fluffy. 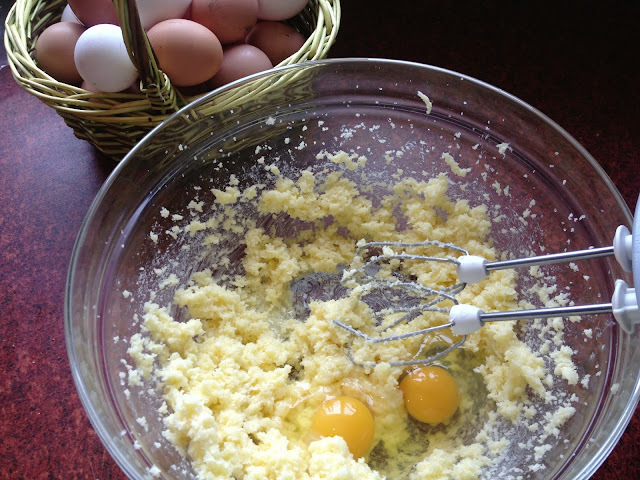 Add in the eggs, beat to incorporate. 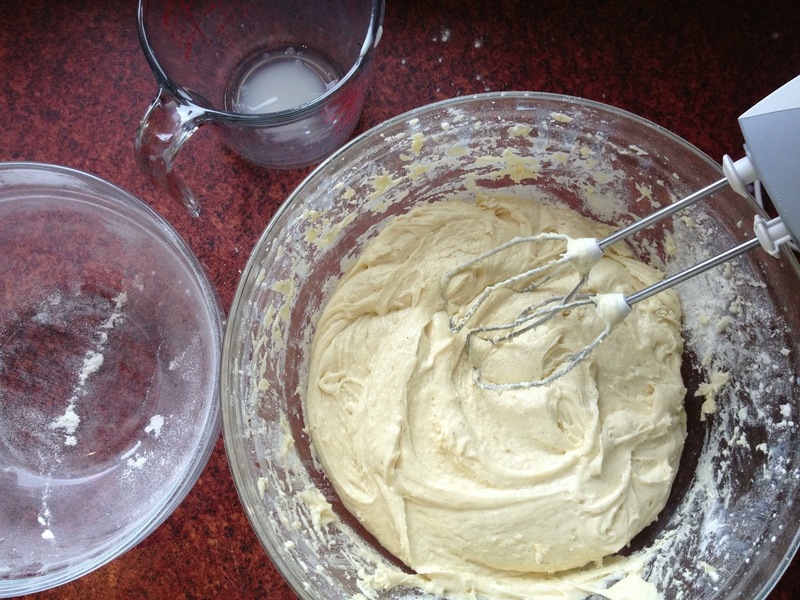 In a separate bowl, mix flour, salt, baking powder and nutmeg. Beat the flour mixture and the milk alternately into the batter. 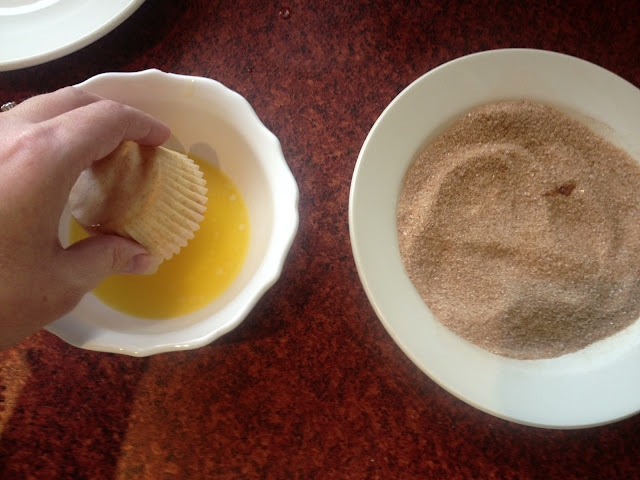 Divide into 20 regular sized muffin cups, lined with paper liners. Bake for 15-20 minutes or until a toothpick comes out clean and tops are golden. 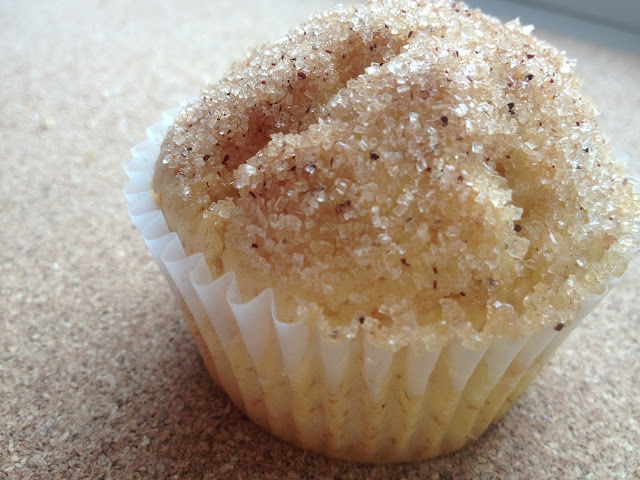 FOR THE TOPPING: Mix cinnamon and sugar in a shallow dish. Melt butter in a bowl. 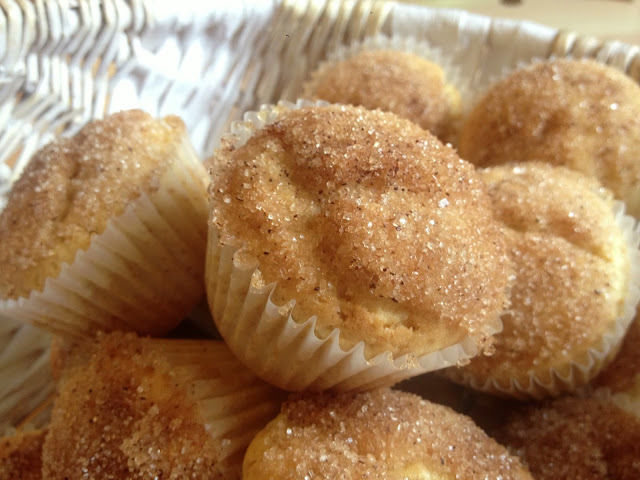 When muffins are cool enough to handle, dip the tops into the butter, then the cinnamon-sugar.